Living in London has so many perks, and at the moment I definitely can’t imagine myself being anywhere else, but every now and then, it’s nice to just escape from it all, and steal a night away somewhere where you can just completely relax, switch your phone off and forget about everything. If you’re searching for the absolute best in boutique luxury hotels in a picturesque and peaceful setting, then you need look no further than Dormy House. 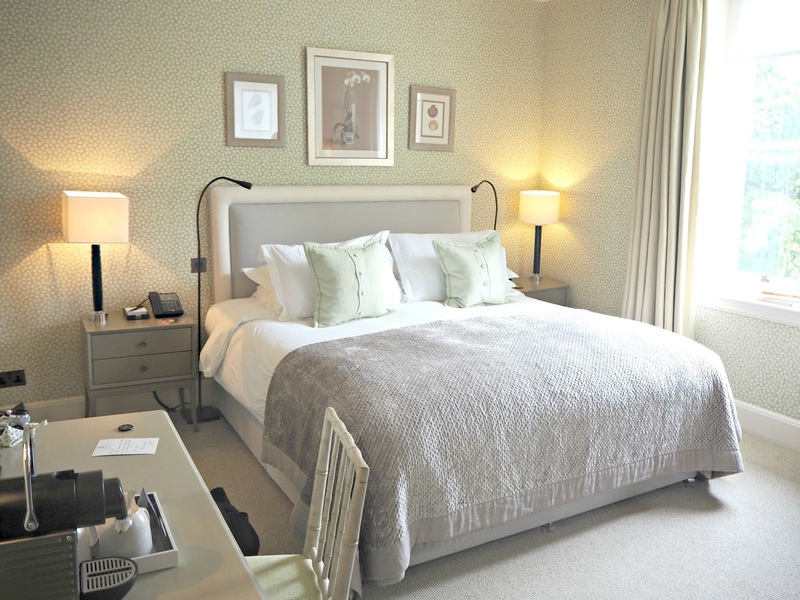 The newly renovated hotel just a few miles outside of Cheltenham, Gloucestershire is set in a 17th Century Cotswold Farmhouse, now a fabulous boutique destination following a £10million renovation. Charlie and I stayed a night at Dormy House after I won a competition at the Debenhams Press Day – boy was that the most productive selfie I’ve ever taken! 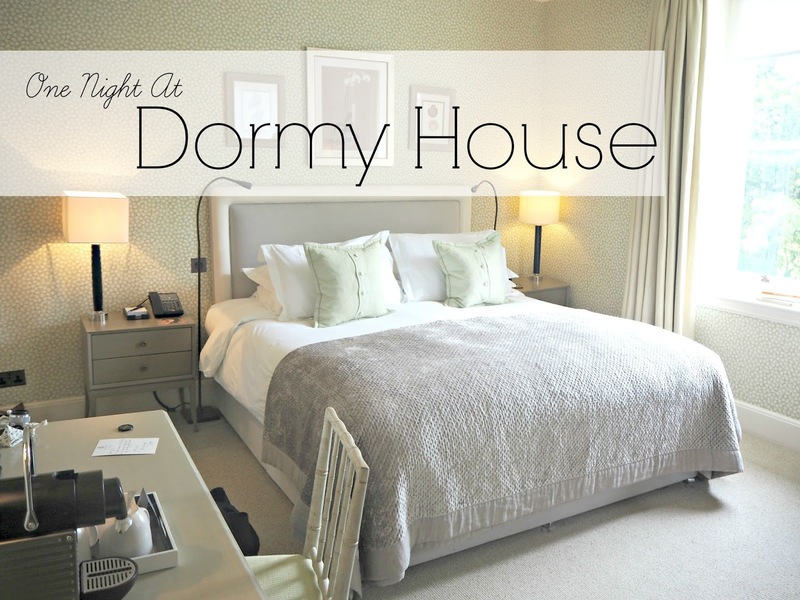 Dormy House is part of a private family’s portfolio of properties within Farncombe Estate, in the Cotswolds. As well as Dormy House, Foxhill Manor and The Fish Hotel also occupy the 400 acre plot of land set overlooking the breath-taking rolling Gloucestershire hills. The first thing that stood out to me when we entered Dormy House was the refined, contemporary aesthetic which still holds true to the properties original use as a working farmhouse. On closer look, you notice the small details which make Dormy House so spectacular. The fresh peonies on almost every table, the hand-stitched owls which you’ll find hidden away in most rooms, the beautiful recommissioned antique farmhouse style furniture mixed with modern comfortable pieces. There’s a sense of luxury throughout the whole property, but not compromising on warmth, and a friendly welcome awaited us at reception, and soon we were being led up the staircase to our spacious, light and luxuriously appointed room; Number One. Each of the 40 guest rooms has been individually decorated, and although each differ in size, from intimate, to splendid, to ‘Top Notch’, they all benefit from beautiful traditional decor, fabulous quality furnishings and modern luxury comforts. The giant bed covered in luxurious cotton linens beckoned for a truly peaceful and comfortable night’s sleep, which was helped along by a spritz bottle of Temple Spa sleeping mist which was left by our pillow after the turn-down service. A range of home comforts is also to hand, including Nespresso coffee facilities, fresh fruit, and a range of luxury teas. A jar of cookies also called invitingly to us next to the handwritten note welcoming us to Dormy House. 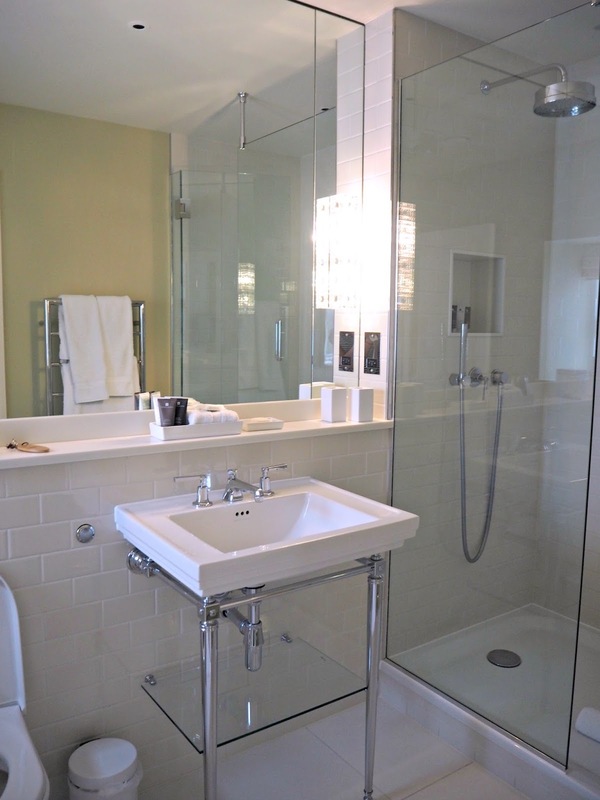 The bathroom was a haven of modern conveniences with antique farmhouse-style luxury. Attention to detail was key here with the fixtures and fittings and subway tiles giving a Pinterest-worthy finish to the moderately sized bathroom. The quality of the amenities is complemented by the Temple Spa toiletries on offer, which I enjoyed pampering myself with after our long journey. Once unpacked, Charlie and I headed straight to the hotel spa. This is where the hotel truly stands out; after being voted ‘Best Spa Hotel’ we had high hopes, and weren’t disappointed. Set in the uplifting rural indoor-outdoor space behind the main house, the tranquil pool area was an oasis of calm, the heated infinity pool was ideal for lengths, but Charlie and I chose to laze in the warm waters before curling up poolside with our books. The outdoor hydrotherapy pool was next on our agenda, the warm water jets almost sending us both to sleep! Back inside is the Thermal Suite, where you can enjoy the gentle warmth of the Lavender Infusion Suana, sourced from Cotswold lavender fields, or the dry heat of the Hot Juniper Finnish cabin. We were thankful for the cool water hoses, and kept the cool running water over our feet before discovering the Tropical Storm shower, which has mist and ‘typhoon’ settings to replicate the experience of a Caribbean storm! We didn’t have time to use the gym or any of the treatments, but the spa menu looked heavenly, and is definitely a reason for us to return! Once thoroughly refreshed and relaxed, we headed down to The Potting Shed, one of the hotel’s restaurants. The setting embodied the ambience of the hotel by being elegant and comfortable while still keeping some farmhouse details. Those seeking a more formal dining experience can dine in the Garden Room or enjoy a Private Dining experience. Once downstairs, Charlie and I enjoyed cocktails from the extensive menu in the lounge, before being led into The Potting Shed. The food menu is carefully-considered, focusing on traditional British dishes and local organic produce. All of our dishes were generously portioned and deliciously flavoured. My 18 Hour Slow Cooked pork belly was the most melt-in-the-mouth experience, and Charlie enjoyed fish caught on British shores. We just managed to squeeze in a desert too – we just couldn’t say no to the poached rhubarb custard brûlée! After a blissful night’s sleep, we were greeted to fresh milk for our tea, and a newspaper outside our door, before we headed downstairs to the Garden Room for breakfast. With continental and cooked options available, the breakfast menu is also focused on local produce and home grown ingredients. The buffet comprised of a selection of cereals, cold meats, pastries, as well as the tastiest pots of yogurts that I can say I’ve ever tried. 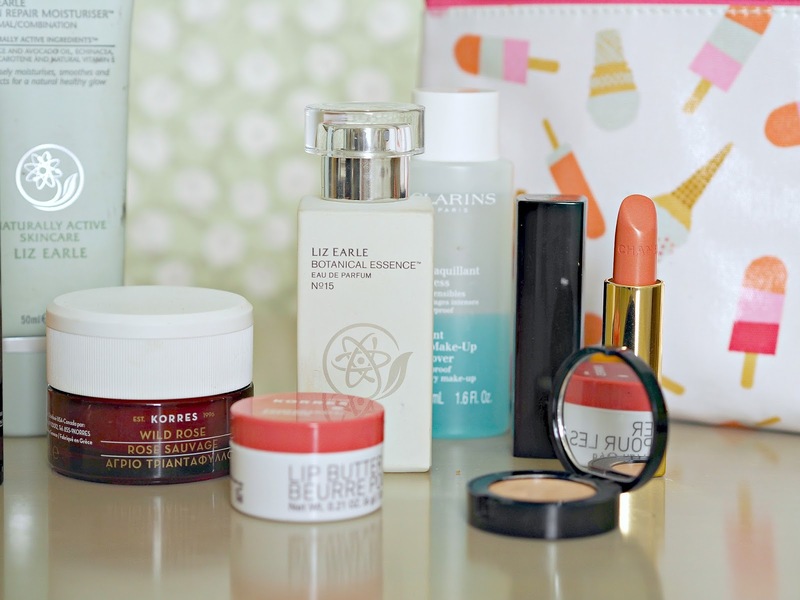 Of course I just had to share a snippet of the beauty products that I took away with me for the long weekend! 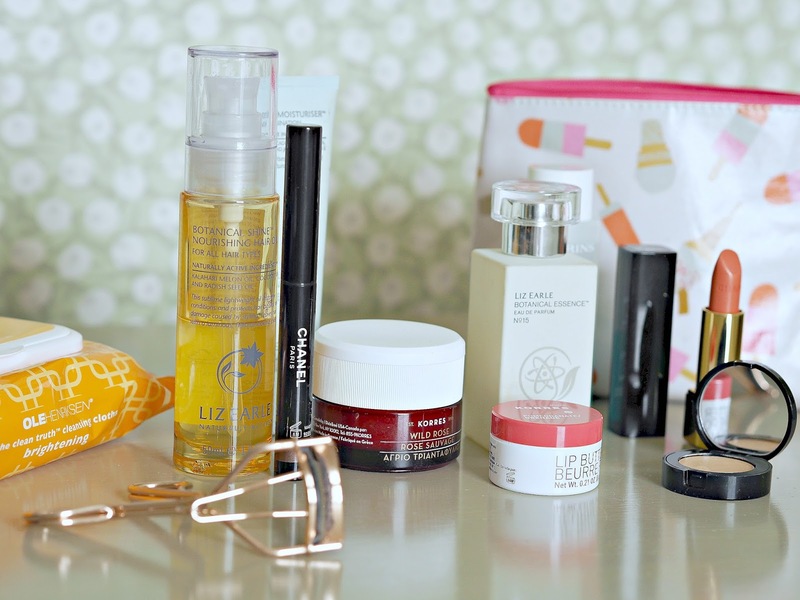 Before heading off on our trip, I popped into Debenhams and treated myself to a gorgeous new lipstick and eyeshadow crayon from Chanel, so I took these new pieces as well as my Bobbi Brown foundation and Concealer. My fragrance for the weekend was Liz Earle’s Botanical Essence, and skincare included Liz Earle nourishing moisturiser, Clarins makeup remover, and the beautifully fragranced Korres Rosehip Nigh cream and lip balm. All in all, our visit to Dormy House was an experience that I will remember for a long while to come, and one that I would absolutely love to repeat in the future. Whether returning back to the Cotswolds to visit family or to immerse myself in the tranquility of the countryside, Dormy House is certainly the place that I’ll be remembering as my happy place in the Cotswolds. Thank you Debenhams for organising the stay! Next Post Benefit’s They’re Real – Now in Colour!